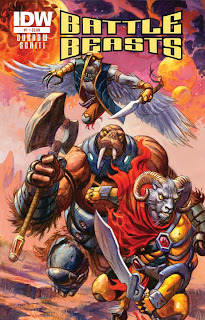 The new Battle Beasts IDW comic book is coming a heck of a lot sooner. We just received this shot of a page in the new issue of Diamond Previews advertising the comic as a 4-issue limited series... and Transformers started off as a limited series, and look at it now! It's due in July, and IDW Publishing posted a solicitation which also confirms a variant cover. Apparently, the whole thing should be kicking off in time for Comic-Con! 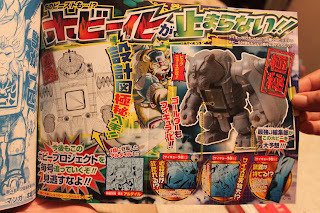 "Great to see some designs I did for Takaratomy "Beast Saga" coming to (plastic) life : in this pic Coelence & Pirazon!" I'm assuming Coelence is on the left and Pirazon is on the right, but I guess we'll know for sure later! 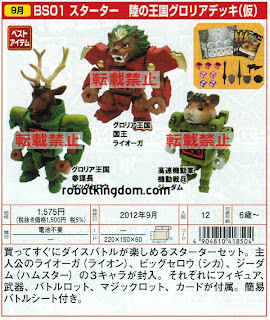 Beast Saga: Painted Figures Revealed, Beast Fight Collection? Commence pants-dumping jokes, because painted Beast Saga figures and pricing in Japan have been revealed! In short: they're not expensive, but not as cheap as what Diamond's line is likely to be in the USA. 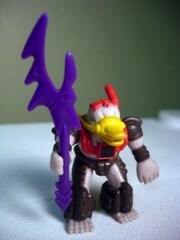 RobotKingdom posted a ton of pictures to Facebook of Transformers and, of course, the Beasts. Their store doesn't have pre-orders up yet, but hey, it's early. Of particular interest: they don't have the traditional "Battle Beasts" eyes, the single-color robotic peepers like the figures of the 1980s-- Diamond's line artwork appears to have retained this trait. On the other hand, Beast Saga seems to have more in the way of cybernetic elements and insane goggles. So I'm not crowning either as "better" just yet, as each line seems to have familiar classic elements and new changes making neither "just like the originals" just yet. So far it looks like we're looking at a minimum of 18 figures, some die packs, a game board of some sort, and a bunch of things I don't know because I don't speak Japanese. There is no known plan for a US release, but the year is young, and sometimes Hasbro or whoever sits on this stuff for a convention or something. What I do know is this: set aside $150-$200 if you want in on this action. Minimum. These might be blind boxes, I can't tell. 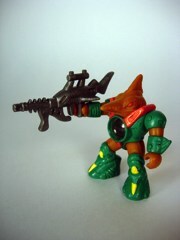 Here's something new: LittleRubberGuides.com launched a swell Visual Guide for Battle Beasts Collecting yesterday! It has an amazing selection of packaged photos with the cringing low prices of the late 1980s. Lionel PlayWorld sold 2-packs for 97 cents! Argh! Well, check it out. It's a great resource. 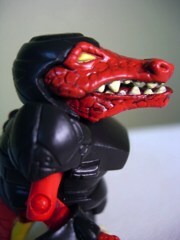 C2E2: How Many Battle Beasts Minimates Are In Series 1? We Ask Diamond! Intrepid contributor Shaun Clayton went to C2E2 for the blog, and he sent along a recorded quick Q&A with your pal and mine, Zach Oat of Diamond Select Toys! Here's the choice quotes you need to know. "This year series 1 will be coming out at Toys R Us and specialty. I do not know the assortment count for specialty, whether it will be four-packs or two-packs, and I do not know how much overlap there will be between them and the Toys R Us wave, but since there will be 8 figures in the Toys R Us wave, expect there to be anywhere from 12 to 15 different releases in series 1, in addition to the exclusive 2-pack we're doing for San Diego [Comic-Con in July]." "[When it comes to Minimates] Toys R Us and specialty always get exclusives, but it's a question of whether any will be shared between the two waves. It'll either be like the old Marvel movie formula, where they share 4 figures, or it'll be like the Marvel comic formula, where there are 8 in one [Toys "R" Us] wave and 7 in the other [specialty] wave, or it will be like the Ghostbusters formula where there are 8, and there is a 4-pack that has 2 new characters. Or there may be multiple 4-packs. I don't know if the specialty line has been nailed down at this point." With all the hubbub about Beast Saga and Battle Beasts this past week, you might be wondering-- as I was-- what's going on with Rise of the Beasts? Some of you have even emailed me asking/telling me what you heard, so I bugged Jon Karis for a quick update. In short, there's nothing new right now, but there are discussions regarding the manufacturing to move things forward. So for those of you saying this line is dead: no, it is not. As always, more as we have it! 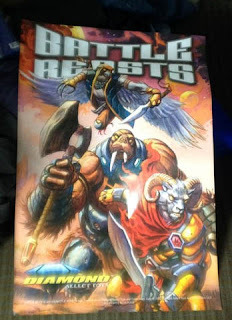 In addition to everything announced, it turns out there are a few more giveaways at C2E2 if you like Battle Beasts. On eBay, some guy is selling a poster! A free poster, mind you, but it's not like I'd pay for it anyway. It's basically the same artwork as the freebie ashcan (promotional) comic book. So the tally for C2E2 so far: Red Vorin, Grey Vorin, Comic Book, and Poster. What else did you find? Let me know! One of the most fascinating things about toy lines in the 1980s and 1990s is as they wind down, nobody really knew what was going on at the time. The final series of Star Wars, Battle Beasts, and other lines were tough to tell because with no real marketing support, no internet, and no resources, rumors and "my cousin got this somehow" were our main sources of intel. As such, I have vague memories of the final US series called "Shadow Warriors" (Laser Beasts in Japan) and I didn't really have much of awareness of the line (beyond it existing) until recently. Heck, I didn't even intend on getting Spark Shark until he showed up in a collection with a bunch of rubsign figures I was after. By himself, he sells for $15-$20 (no weapon) and $30-$35 (with weapon), and he's probably the cheapest and seemingly most commonly sold Laser Beasts figure. ...for retailers. There's something called a Diamond Retailer Summit and there's some coupon book, and you can get one through that. Does this mean anything to you? I have no idea. 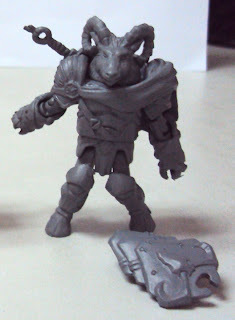 But it's a grey unpainted figure, which actually gives you a decent look at its sculpted detail. It looks kind of like a prototype and hey, I love test shots. So check out Vorin the ram, now more opaque than ever! Take note of the little flame-like pin on his cape, and the lack of toothy crotches. The shield is quite nice too, and a great nod to some of the most expensive Laser Beasts accessories. And the head looks a little chubby, but I like it. It's cute. Now to find one! I'm told I should bug my local comics retailer. Press Release Dump: Diamond Select Toys and IDW Publishing to Unleash the Battle Beasts at C2E2! We got the press release, now we're going to share it with you. TImonium, MD (April 12, 2012) - Since 2010, Diamond Select Toys has been searching to find the right partner to introduce their Battle Beasts brand to a broader audience. Now the search is over, and DST and IDW Publishing have teamed up to immortalize a new breed of Beasts! 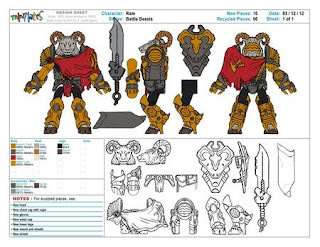 At this year's Chicago Comic and Entertainment Expo (C2E2), which runs from April 13-15, the two companies will offer a taste of what's to come: DST will give out an ashcan preview of IDW's upcoming BATTLE BEASTS comic-book mini-series, as well as an exclusive promo Minimate of one of the book's lead characters! "We are thrilled to have found a partner in IDW, a company that understands toy fans just as well as they understand comic book fans," said director of Diamond Select Toys Chuck Terceira. "Their experience with licensed comic books -- and with the dedicated fan bases they write for on a monthly basis -- is proof that the Battle Beasts brand is in the right hands, and we look forward to working with them for this mini-series, and, hopefully, beyond!" The mini-series is written by Bobby Curnow (Godzilla Legends, Night of 1000 Wolves) and penciled by Valerio Schiti (Teenage Mutant Ninja Turtles: Donatello, Dungeons & Dragons: Eberron). It focuses on a group of renegade Beasts who return to Earth to protect the ultimate weapon (and the human who activated it) from an armada of their violent brethren. 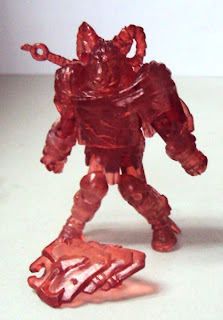 The ashcan will reprint the first eight pages of issue #1 in full color, and fans will be able to get a free translucent Minimate of the ram Vorin while supplies last. Both will be given away during C2E2 by DST at booth #311. "BATTLE BEASTS is a great fit for IDW", said writer Bobby Curnow. "What's so important about toys is they enable kids to build worlds in their imaginations, and create stories for those worlds. Since I never really grew up, getting the chance to help create the new Battle Beasts in comic form has been a fantastic and supremely fun experience. The world has been turned upside down with the arrival of the Battle Beasts, and we're going to have a great time showing just how crazy things get. 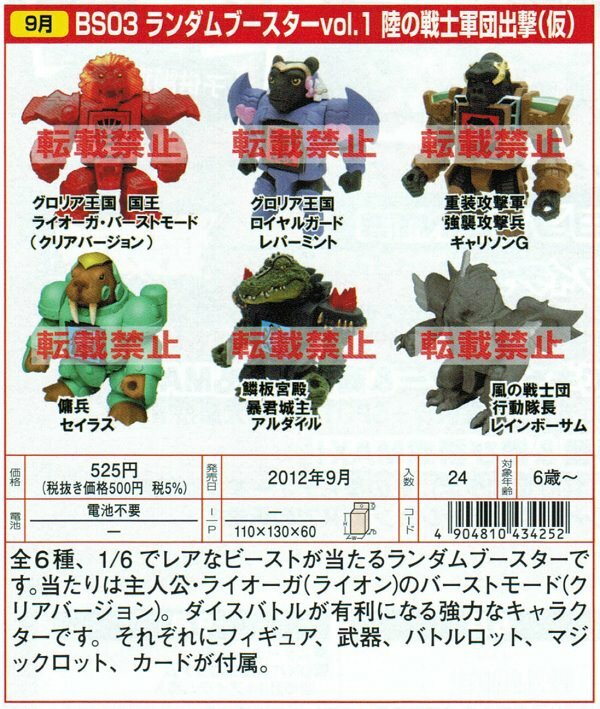 IDW has a lot of experience finding riveting stories in toy-based licenses, and I hope BATTLE BEASTS is no exception. I know for a fact that Valerio is knocking it out of the park. His art is going to floor a lot of people." And the excitement does not stop there -- at San Diego Comic-Con (July 11-15), IDW will launch the BATTLE BEASTS mini-series with issue #1, and DST will unveil the first full wave of Battle Beasts Minimates, which will be in stores in late fall of 2012! The first wave of two-packs will focus heavily on characters who appear in the comic, and will have a gameplay element, as well. DST will also have an exclusive two-pack of Battle Beasts for sale at the show. Minimates are 2-inch minifigures created by Art Asylum in 2002. This year marks the brand's 10th anniversary, and in that time Diamond Select Toys and Art Asylum have released over 1,000 Minimates for nearly 50 separate licenses. Highly detailed and highly poseable, each Minimate features 14 points of articulation and comes with plenty of interchangeable parts and accessories. 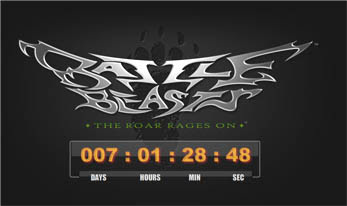 Visit BattleBeast.com for more information about the comic book and toy line. IDW is an award-winning publisher of comic books, graphic novels and trade paperbacks, based in San Diego, California. Renowned for its diverse catalog of licensed and independent titles, IDW publishes some of the most successful and popular titles in the industry, including: Hasbro's The TRANSFORMERS and G.I. JOE, Paramount's Star Trek; HBO's True Blood; the BBC's DOCTOR WHO; Nickelodeon's Teenage Mutant Ninja Turtles; Toho's Godzilla; Wizards of the Coasts Magic: The Gathering and Dungeons & Dragons; and the Eisner-Award winning Locke & Key series, created by best-selling author Joe Hill and artist Gabriel Rodriguez. IDW is also home to the Library of American Comics imprint, which publishes classic comic reprints, and Yoe! Books, a partnership with Yoe! Studio. IDW's critically- and fan-acclaimed series are continually moving into new mediums. Currently, Jerry Bruckheimer Films and Disney are creating a feature film based on World War Robot, while Michael Bay‘s Platinum Dunes and Sony are bringing Zombies vs. Robots to film. Diamond Select Toys and Collectibles, LLC, was founded in 1999 by sister company Diamond Comic Distributors, Inc. Headquartered in Timonium, MD, Diamond Select Toys was envisioned to create unique and exciting collectibles for children and adults alike, and today the company licenses a wide range of pop culture properties from partners such as Marvel Enterprises, Microsoft, Universal Studios, Twentieth Century Fox, Hasbro, MGM and Sony Pictures. In 2007, Diamond Select Toys acquired select assets of the New York based Art Asylum, creators of the global Minimates brand. Minimates have been recognized as the #1 selling block figure in the world and were the first toys ever to be inducted into the ToyFare Magazine Hall of Fame. In addition to Minimates, Diamond Select Toys manufactures a broad variety of products for the specialty and mass markets, including figures, statues, banks, role-play items, replicas and housewares. Can you read Japanese? If so, feel free to make yourself at home in our comment section and translate to your heart's content! Your pal Sylvain strikes again! 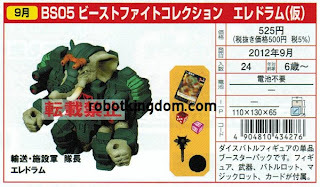 He sent along two notable pictures, the above shows a TakaraTomy logo on the figures, meaning, well, it looks like this could well be a sequel to Battle Beasts, so feel free to start speculating wildly about reissues of the 1980s figures, or if given the different name "Beast Saga" means there might be some global launch involving Hasbro, as, after all, Hasbro has a long relationship with TakaraTomy, Takara, and Tomy with the likes of Beyblade, Zoids, Transformers, and the original Battle Beasts. 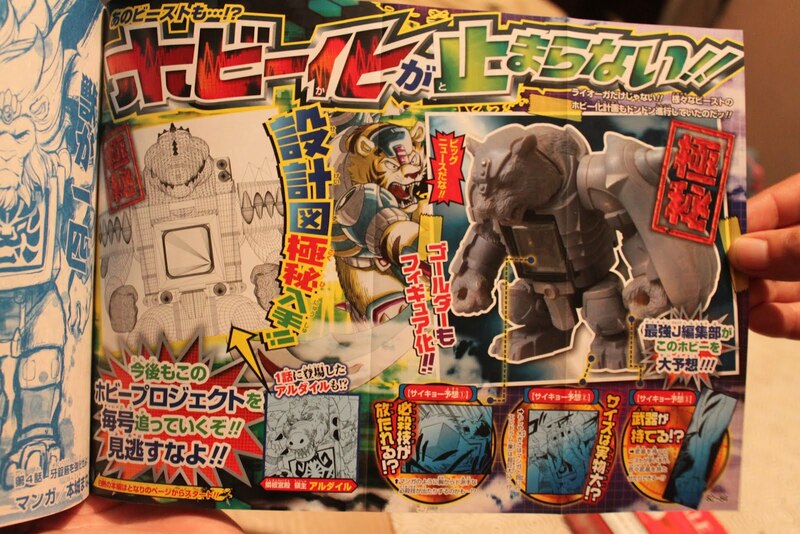 The second one shows a new tiger figure prototype sculpt and some sort of alligator, because we didn't get enough of those in the last couple of years. Thanks for emailing us these pictures overnight, Sylvain! New Diamond Battle Beasts Site Leaked/Launched Early? 1. Comic Book. Digital version of the C2E2 comic giveaway introduces 3 of the characters. Comic is being given out at the C2E2, it seems. 2. C2E2-Exclusive Clear Vorin Figure. Vorin is a ram, and he's the show's free figure. The toys page shows him (bagged) as well as the 4 previous promo figures, all of which have no specific character name. 3. Character reveals. 3 characters are named - Vorin the Ram, Gruntos the Walrus, and Merk the Edie Falco. 4. Series 1 and 2 are mentioned by name but will not be revealed until later. Series 1 is said to be coming Fall 2012, and revealed at Comic-Con in San Diego this July. There is no obvious connection to Beast Saga. Aside from the basic concept and what appears to be a flame symbol on Vorin's outfit, there's no real connection to the old Hasbro or Takara toys either. It looks fun. I'm in. Series 2 of Battle Beasts refined the figures a little bit with better paint jobs, stranger figure choices, and big changes to their feet. The copyright information was moved to the soles of the figures, and a foot peg hole was added-- previously released Series 1 figures had flat feet (like Gormiti toys) and the copyright information was usually on their backs. 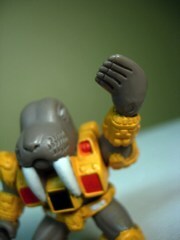 Wolfgang Walrus is a fine example of a good concept refined in its second series, and he also just happens to look more than a little like the Transformers toy Longtooth. 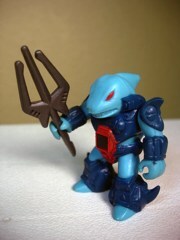 As I'm a sucker for ocean life toys, this was one of the many figures I requested as a kid and by gum I've still got him. 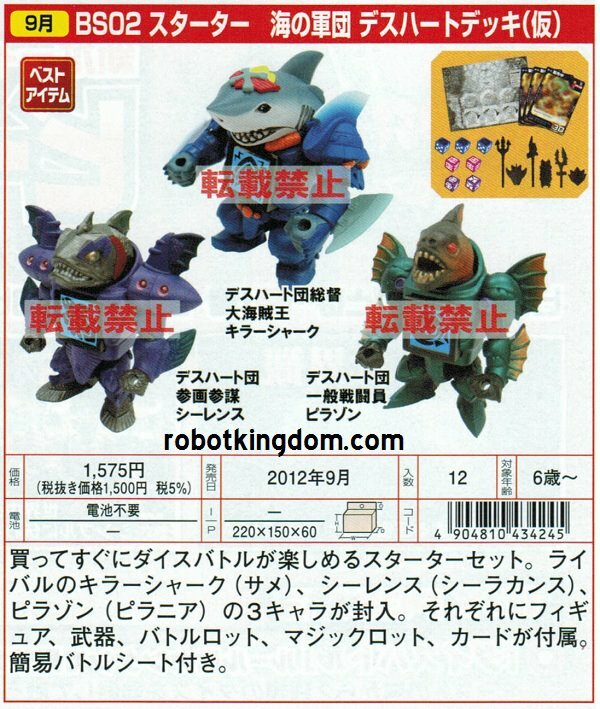 Sawtooth Shark is the first classic guy we're going to look at this week, and he's pretty awesome. Heck, the entire line is fantastic and perfectly sized for the modern toy collector. Worried about them taking up too much room? They're 2-inches tall. Need a toy that won't fall over on your desk? Their footprint is small and they're sturdy, so they can sit on top of a thin LCD monitor. They have but two joints, but if you want a toy to display on your desk it's not like you'll be having them fight much. Their giant feet make it harder to tip them over, too, which I appreciate. 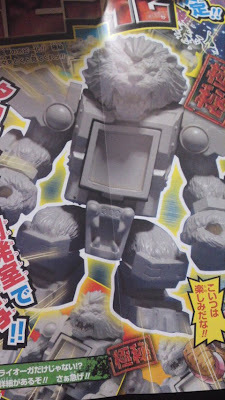 New Japanese Beast Saga Prototype Figure? How big is it? No idea. Who's making it? 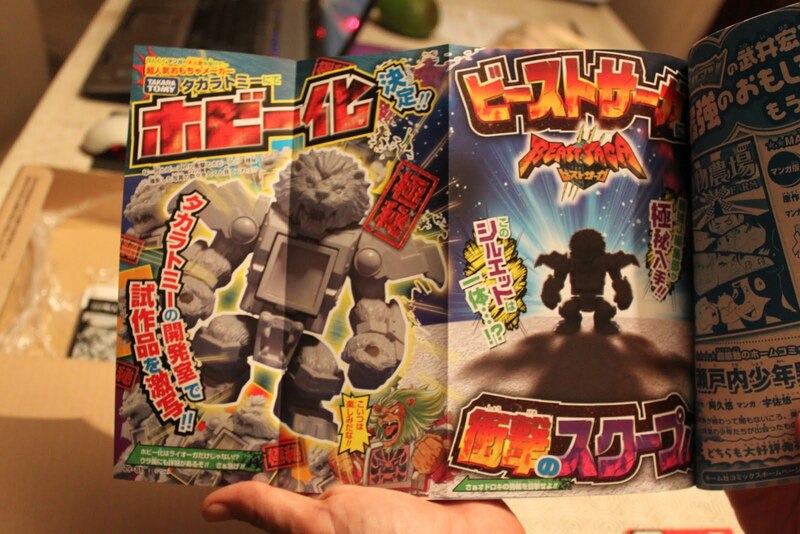 Not sure, but speculation is pointing to BanDai because they own the magazine which the comic appeared I am later hearing there's a Takara/Tomy copyright on the page. Why does his crotch have fangs, and does this make it a her? Also, not sure yet. Stop asking so many questions! I'm giving you everything I got! As of right now there is no known connection between Beast Saga and the Diamond Battle Beasts announcement taking place this week, but the week is still young. Stay tuned! UPDATE: You can find a little bit of a translation, here. Welcome to Beast Week 2012! 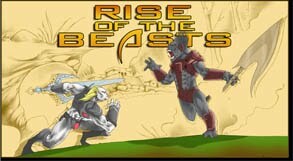 Last year 16bit.com focused on Beast Wars Fuzors, and this year it's Battle Beasts! We're counting down to the C2E2 show in Chicago, where Diamond Select promises news on the long-gestating revival of this classic figure brand. 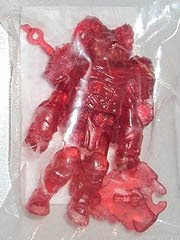 So let's get started with the latest figure to be sold in stores with the brand name, with the Battle Beasts Red Alligator Warrior. It's almost time! But there's no real news yet, other than what appears to be an official Twitter presence. I say "what appears to be" because I would have guessed them to be based out of Maryland and not New York, but what do I know? What I do know is in about a week, we should have some actual news.